A Long-Term Solution for Stabilizing Denture for Your Comfort! If you are missing all or most of your teeth, like other 36 million people nationwide, Implant-supported bridge or denture is the latest solution for your lost natural teeth to regain look and function of your original teeth for more comfortable chewing, speaking, and smiling with confidence. In addition, denture implants improve your jawbone structure and help you look younger and healthier. 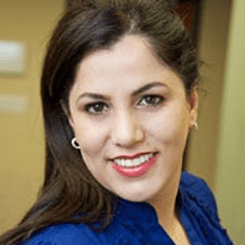 At Aria Dental of Mission Viejo, our highly skilled cosmetic dentist, Dr. Maryam Horiyat and our American Board-Certified Periodontist and implant specialists have completed extensive continuing education and training with many years of experience can help you find the best treatment for your missing teeth and related issues. Do you want to learn whether you’re a candidate for this exciting approach to implant-supported dentures or bridges? Please call (949) 364-9600 or for an appointment with top orange county implant dentists at Aria Dental of Mission Viejo. An implant-supported denture is a type of overdenture that are attached and supported by dental implant. A traditional dentures rests on you gums rather than the dental implants. Implant-supported dentures are used when a person doesn’t have any teeth in the jaw but has adequate bone in the jaw to support implants. 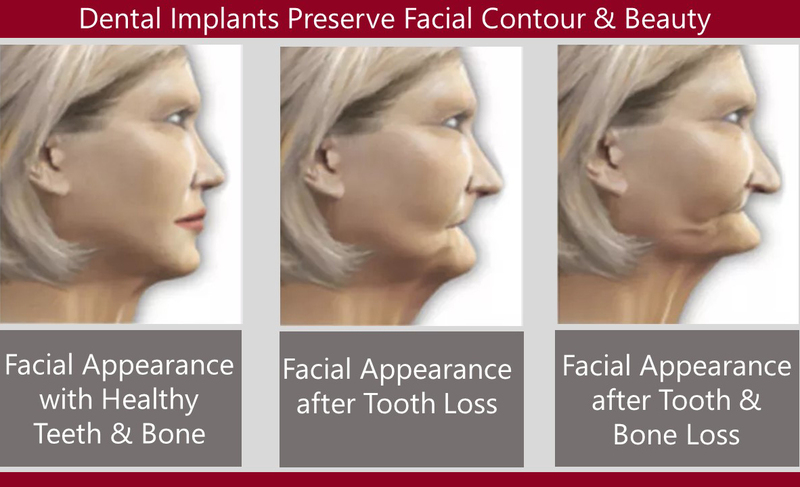 Dental implants integrate with the living bone, giving the denture a firm foundation. This means you can eat, speak and smile with confidence and without restrictions. The dental implants will support the jaw bone for improved long-term oral health. 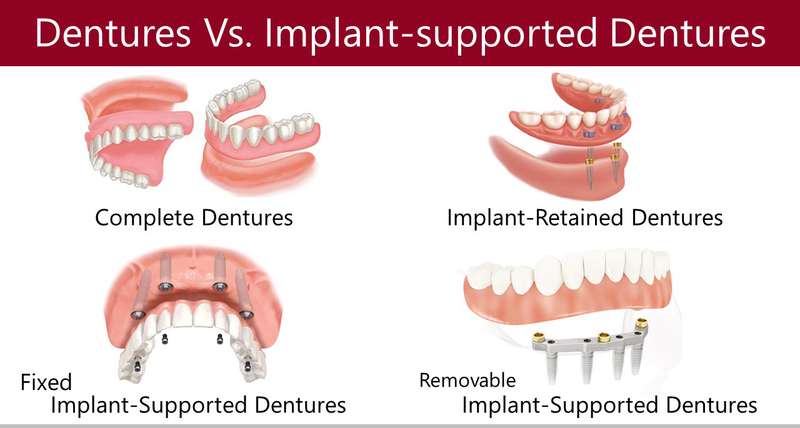 When Are Implant-Supported Dentures an Excellent Choice? Implant supported dentures are an excellent choice for individuals who are missing all or most of their teeth in lower or upper jaw bone. If the outlook of teeth is poor, you may consider implant-supported dentures. Will I Have Teeth in My Mouth During This Process? 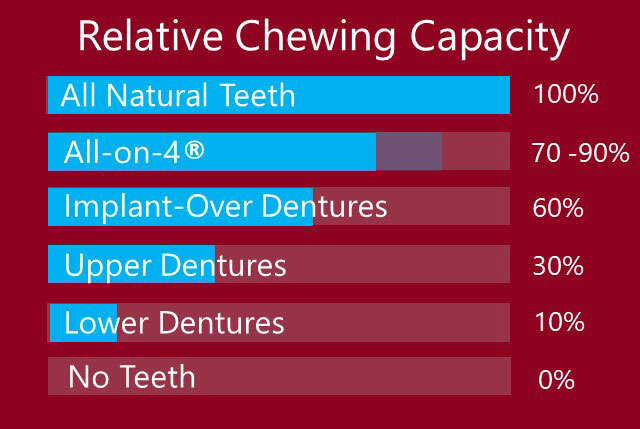 This is the number one questions we get concerning implant-supported dentures. YES! You will always have teeth in your mouth during this process. We have many patients who do not have enough bone, but they are able to have implant-supported dentures because our periodontists and implant specialists routinely perform bone grafting procedures. Fixed Full-Arch Implant Supported Bridges consist of 4-8 implants and a non-removable dental bridge that is placed permanently to the implants. Implant-supported bridges are the most natural-looking and acting replacement for missing teeth. 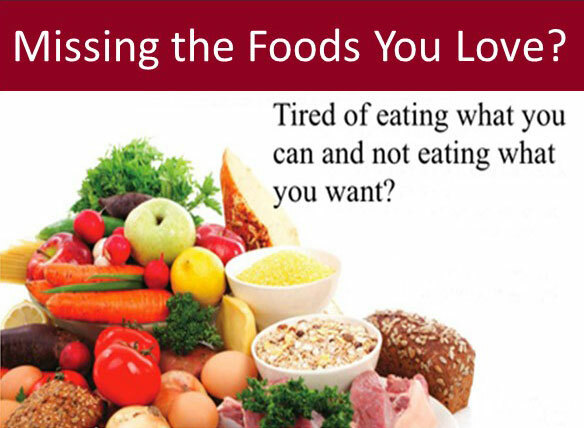 Chewing power increase to as much as 99% of the normal bite force, which has a significant impact on a person’s digestive process. With fixed implant-supported dentures, there is no need for the fake palate covering the roof or floor of your mouth. Best of all, you don’t have to take your dentures out or gag with your dentures. The prosthetic denture can be made of ceramic, resin, or Zirconium. Zirconium bridge is the latest material introduced into implant dentistry that has a stronger, more durable, and visually appealing as compared to other types of bridge. Also Known as “Teeth in 1 Day”, All-on-4 or All-on-6 is a newly designed and innovative system of implant-supported denture, which consist of a non-removable denture that attaches to 4-6 dental implants. 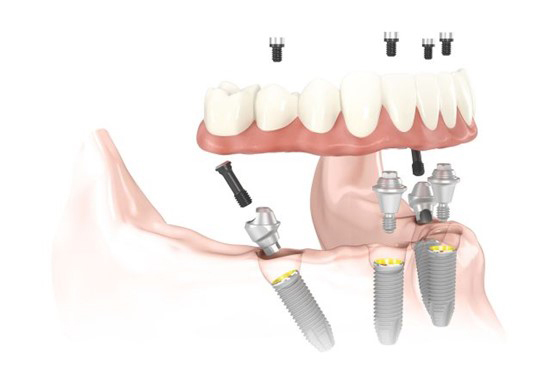 The All-on-4 / All-on-6 dental implant techniques are ideal for patients who have low bone density and limited jawbone tissue. 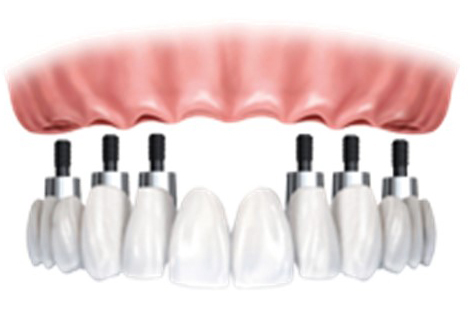 Implant supported overdenture consists of 4 or more dental implants. 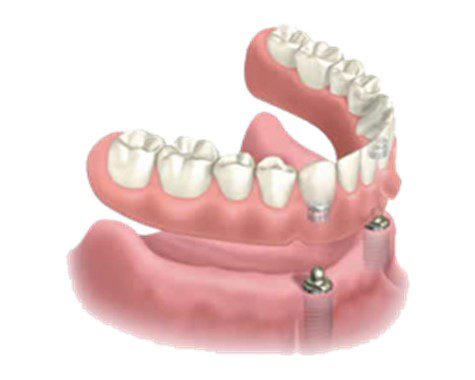 It is a removable prosthesis that attaches in some manner to dental implants. There may be a metal bar to support the denture. Compared to other implant supported restoration method, implant supported over-dentures require fewer implants for each jaw, reduce need for bone grafting, has faster treatment and healing time. Thus, your placement arch can be attached to your implants immediately after insertion. 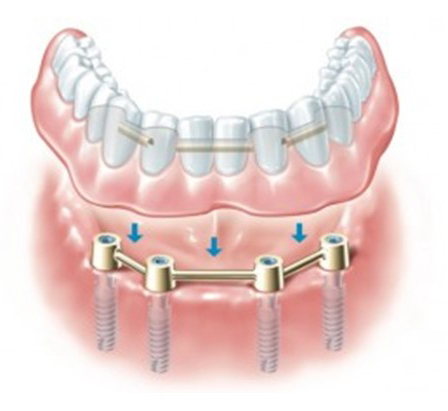 Denture stabilization consist of minimum 2 implants per arch. 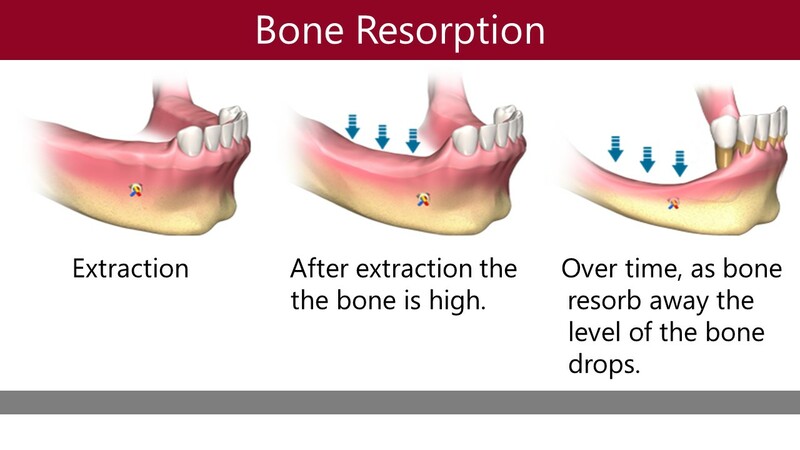 Implant stabilization not only prevents facial shape changes caused by jaw bone recession, but also provides needed support for correct speaking, chewing, and smiling.